The debate over school vouchers may be over, but changing the education system remains among the most popular topics for Utah’s lawmakers preparing for the annual get-together in January. The list of education bills scheduled for debate is a mile long. It includes everything from perennial proposals to reduce class sizes to plans for year-round schooling. Lawmakers faced with growing student numbers are pressing for “efficiency,” while the public-education lobby feels momentum after the defeat of vouchers. For the teachers union, that means, in part, pushing for smaller class sizes, which the union championed during the campaign as an alternative “reform” to spending public money on private schools. Rep. Karen Morgan, D-Salt Lake City, will rerun her bill— deemed too expensive by fellow lawmakers last year—to reduce class sizes in kindergarten through third grade. Many backers of alternative-school movements, such as charter schools, she said, cite small class size as the reason for taking children out of traditional public schools. Last year, the Legislature hiked teacher salaries as part of a 24-percent increase in education spending. This year, Gov. Jon Huntsman Jr. is calling for more of the same, asking for teacher salary hikes of 6 percent to 8 percent each year until starting teacher salaries reach $40,000. Salary hike ideas proposed by lawmakers include a pilot program for year-round schools and giving some teachers the option to earn more by working a longer school. Other bills propose paying teachers at differing rates depending on the subject taught or expertise of the teacher. Rep. Jim Bird, R-West Jordan, thinks he has an innovative solution to Utah’s high student-teacher ratio: adding more teachers to existing classrooms. “We’ve heard ‘lower class sizes’ forever,” he says. “But building more schools is not really an option. It just costs too much money.” His proposed pilot program would place an extra novice teacher in some elementary classrooms, at once creating a mentoring program for new teachers and effectively cutting the student-to-teacher ratio in half. Conspicuously missing among all the education talk is any discussion about what the Utah State Board of Education has listed as among its top three priorities: improving the instruction of minorities, particularly Latinos. “We know the key factor in children’s success is parent involvement. That’s more powerful than anything the system does,” Shumway says. But active participation in school is difficult for parents who don’t speak English. Huntsman’s goals closely mimicked the priorities of the education board in his budget last year. This year the board’s other priorities include money to increase teacher salaries and to send fourth- through sixth-grade math teachers back to school. Those requests will come on top of calls for significant budget boosts to pay for inflation and at least 15,000 new students expected to enroll next fall. 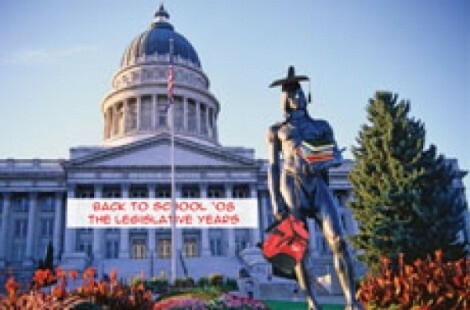 The wackiest education bill may be a proposal to carve a new state out of Utah. It comes from Rep. Neal Hendrickson, D-West Valley City, a bus driver for the Granite School District, who says a co-worker asked him to run the bill. The co-worker, Keith Wassink, says the new state idea came to him during the debate about splitting the Granite School District in two, which he opposed. It’s also a commentary on lawmakers’ insistence on vouchers in the face of public opposition, he says.